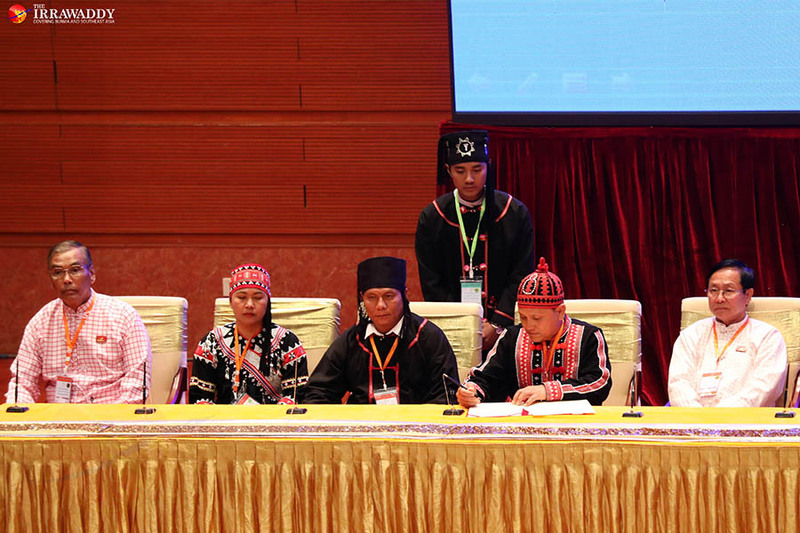 YANGON – Two years and four months after the first eight ethnic armed organizations (EAOs) signed the Nationwide Ceasefire Agreement, the number of signatories expanded to 10 on Tuesday as the New Mon State Party and Lahu Democratic Union signed the pact. The development is a win for the NLD-led government’s Peace Commission, among whose aims are to increase the number of signatories to the NCA, which is considered a gateway to political dialogue. This recent success notwithstanding, peace negotiations with the remaining active armed groups in the northeast and north of the country still face numerous challenges. During more than six years of efforts at peace building, starting in August 2011 under former general-turned-President U Thein Sein, there have been numerous formal and countless informal talks aimed at reaching understandings with the various groups. Based on these negotiations the NCA text was drafted by the ethnic armed organizations and the government’s representatives. It lays out basic principles for holding political dialogues after signing the NCA. However, the informal talks have been less publicized by the NLD government, and this has led to some misunderstandings regarding the negotiations. The government’s Peace Commission has held nine informal talks and nine formal talks with the United Nationalities Federal Council ethnic bloc, of which the NMSP and the LDU are members, during the past 18 months. Having two more signatories will not solve the intensified armed conflict in the country, especially in the north where the Kachin Independence Army and the Tatmadaw, Myanmar’s Army, are engaged in a gunfight. The NMSP signed a bilateral ceasefire agreement with the government in February 2012 and previously in June 1995. It has not had any major clashes with the Tatmadaw in the intervening years. Signing the NCA should help to reduce tensions between the Karen National Union, another signatory, over territorial disputes, which can be discussed by the Joint Ceasefire Monitoring Committee. Speaking at a signing ceremony in Naypyitaw on Tuesday, State Counsellor Daw Aung San Suu Kyi, Myanmar Army chief Sen-Gen Min Aung Hlaing and NMSP chairman Nai Htaw Mon reiterated that signing the NCA is not the end of the process. Rather, they said, it is an entryway to political dialogue aimed at solving political problems through political means and building a democratic federal union. Nai Htaw Mon also urged the government “to continue their efforts to have all stakeholders included in the peace process” and the Tatmadaw “to immediately stop its offensives” against the armed groups. He said that the decision to sign the NCA pact was aimed at advancing the interests of the Union, not just those of one ethnic group, because the interests of minority ethnic groups and the union are intertwined. In 2018, there will be more signatories, said leading peace negotiator U Khin Zaw Oo, the secretary of the Peace Commission, at a press conference held after the ceremony. He led the informal negotiations between the NMSP and the government. But he did not name which groups those would be, saying that he “would not disclose the status of those informal negotiations he has been holding with other ethnic armed groups.” The meetings have been held in Thailand and China over the past year. He said, “We are optimistic there will be more EAOs signing [the NCA] in the remaining 10 months of this year.” As a former lieutenant-general, U Khin Zaw Oo plays a key role in the negotiations as he directly communicates with the Tatmadaw chief. He negotiated the setting up of informal talks between the KIA and the Tatmadaw, which were held earlier this month in China’s Yunnan province. Given his optimism on negotiations, both the State Counselor and the Army Chief reassured the remaining ethnic EAOs in their addresses that the door to signing the NCA was open, especially to those groups in northeastern Myanmar, to take part in the process. Absent from Tuesday’s ceremonial events was the seven-member Federal Political Negotiation and Consultative Committee (FPNCC) bloc led by the United Wa State Army. The bloc seeks an alternative approach to the NCA. The government negotiators prefer to talk to individual groups, rather than to blocs. 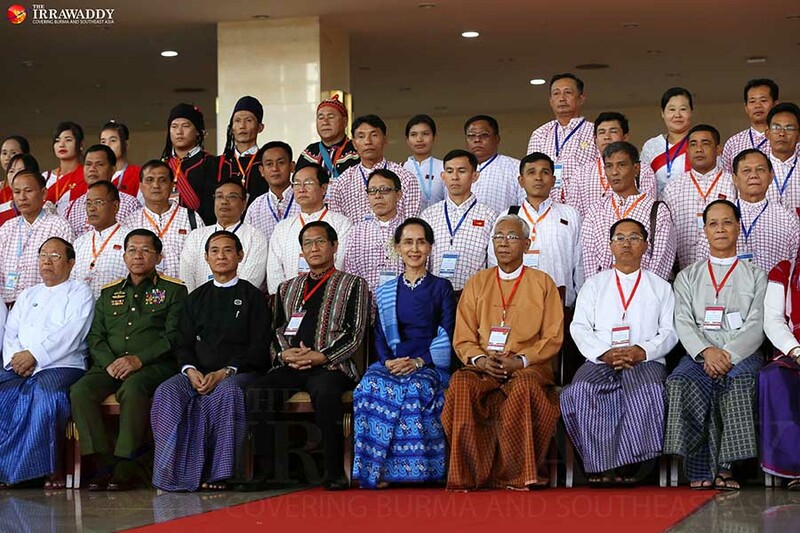 Daw Aung San Suu Kyi urged all sides to join together to build a democratic federal union by “leaving the bad legacy” of civil war that raged for seven decades. As she has done in regular speeches in the past couple of years, she urged the stakeholders to think about the greater good, to consider the future of children forced to live as internally displaced persons due to the prolonged civil war. The speeches sounded good, but the offensives against the minority ethnic armed groups continue. Despite this reality, the Tatmadaw insists that there is no offensive against the armed groups in Shan and Kachin states; it is just protecting civilian lives from those organizations violating existing laws, it says. As two of the UNFC members, the NMSP and the LDU, become signatories, the future of the UNFC is in doubt. It is currently comprised of four active members — the NMSP, LDU, Karenni National Progressive Party (KNPP) and Arakan National Council (ANC). The Shan State Progressive Party/Shan State Army North is preparing to leave the bloc. UNFC was started in 2011 and seven years later, it is left with two groups, which are non-signatories. U Zaw Htay, the government spokesman, said it would deal bilaterally with the KNPP and there is no chance of the ANC taking part in the current NCA talks, as they had tried out various approaches for the group to be part of the NCA process. “But they can take part in the political dialogue process, like other civil society groups,” he told reporters during Tuesday’s press conference. The ANC, like Lahu’s LDU, is considered a political group, with no armed forces. The LDU agreed to take part in the political dialogue without joining a bilateral ceasefire agreement.